There are several fairly well-known steampunk bands out there. I've heard a couple of them live before, and I have to say: they all really look fantastic. [diplomatic smile] The sound, however, is as hit-or-miss as any genre of music - and most of what I've heard falls more on the "punk" side of steampunk. I like a pretty diverse range of music, but - prepare to call me an old fogey - crashing noise and screaming just isn't my thing. 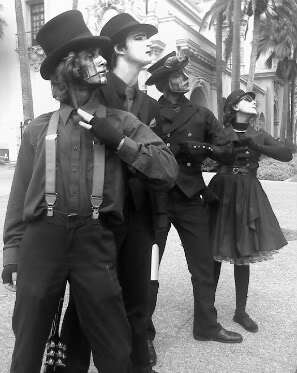 So today, I want to introduce you to a group that's a little...ok, a lot...different than any other steampunk band I've seen. 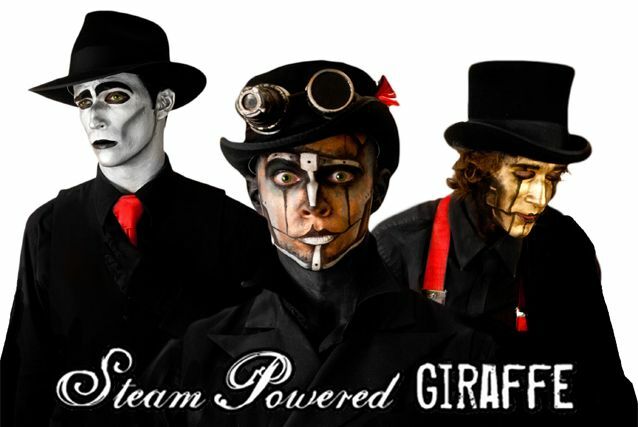 This is Steam Powered Giraffe, "A Musical Pantomime Troupe featuring robot imitation with song." Meaning they're robot mimes, who sing. Gotta love that. Mime has gotten a bad rap over the years, but these guys put it to amazing use. In fact, their movements are so mesmerizing that you're instantly sucked in to the performance, whether the music is to your taste or not. Just watch Rabbit, the "robot" with the goggles. Amazing, right? As a former (amateur) mime myself, I'm awed by that kind of consistent skill. The girl, Upgrade, is no longer featured on their website, so I'm guessing she no longer sings with the group. 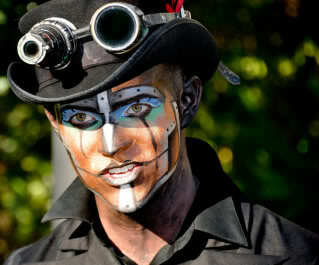 For lots more info, pictures, and video links, head on over to Steam Powered Giraffe's website. Oh, and I also heard a rumor that the group has applied to perform at Dragon*Con this year. Fingers crossed that pans out; I'd love to see them live! We just discovered SPG at an Abney Park show. We love them, and they are even more amazing in person than the videos show, if you can believe that! Even taking a drink onstage and adjusting cords or the instruments, their movements are perfect. I hope your post brings them many more fans. I liked their version of "Never Gonna Give You Up"! I love the way they totally acted like they were old school animatronics. That was really fun to watch. I was confused when I saw that the Bay Area Renaissance Festival is in Tampa, FL. I'm curious how many people have associations with the term "Bay Area" that aren't San Francisco. I can only imagine how sore they must be after moving like that for a few numbers! Really, really well done. My wife and I are at a steampunk con (Wild Wild West Con in Tucson) and we're going to go see SPG in an hour or so. And then I saw this pop up in Google Reader. Color me flabbergasted. Thanks so much for posting this on Epbot! It was my pleasure to hear you like them so much! This absolutely made my day. Thank you!!!! You were a MIME?!?!?! That's so cool. I really love the whole robot thing! I like the music too, of course, but their movements sell it! I'm okay with noise to some extent (I really love Miyavi) so I would love to hear about the other bands too! So cool! And now, sharing of stuff time. Did you see the Steampunk post that was put up on Regresty today? They all spelled it wrong and are just band-wagon jumpers. It's great and not malicious like some of her posts. I often think you Cake Wrecks and Regretsy as two sides of the same snarky coin. You are all the snark and no malice; she's twice the malice, but in a delish way. I mean this as a compliment because I love you both. You have multiple 'younger' readers! Although I am 14.. Haha! has nothing to do with Steampunk, Jen... you will love the pictures. I pretty much grew up in the Tampa Bay area. The Bay Area Ren faire spoiled me for other ones. Enjoy! I really enjoyed your blog post about SPG. You've pretty much hit the nail on the head and I'm really thankful to see this kind of support! I would like to add some clarifications: I've been very close with the band since their birth. As they are versatile and "programmed to entertain you," it's important to mention their music spans multiple genres, not exclusively Steam Punk. From the beginning their main style has always revolved around Vaudeville, but as of late conveniently align their gears into the Steam Punk audience, which has a steadily growing fan base. The Rabbit's brass goggles and classy getup are a perfect example of how he reaches out to this genre, while The Jon and The Spine reach out to other audiences as well. That's the beauty of SPG, from their "old-timey (American folk) sound" to rock n' blues and vaudeville, all ages and a variety of audiences love them. Pandora is going to have quite the task of putting them into categories. They are very much out of the box. I was looking at all their videos on Youtube and the girl is on the video for HoneyBee so maybe she just makes some guest appearances now with the rest of the group. OHhh my son is going to LOVE these guys! He's just starting to fall into the world of steampunk and such (his first 'favorite band' was and still is Dropkick murphys, not your typical teenage angsty male music) and while this group isn't anything like the dropkick murphys, they still are different and unique and totally fascinating, thank you! I don't know if it's because I'm recovering from flu or if the Ny-Quil just kicked in, but seriously, am I the only one who looked at Rabbit and thought, "Damn, he's kinda foxy?" Okay, that's it. I'm going to bed. The SPG videos combined with the Ny-Quil combined with my low-grade fever are going to give me really bizarre dreams. To clarify, the girl robot, Upgrade, has left the band to pursue her acting endeavors. I don't know anything about mimes so I'm confused about why they don't seen to be liked very much. Other than that that was cool to watch ! This is amazing! I'm going to a steam-powered burlesque show in Austin, TX next week. I'll let you know how it goes! I am an 11 year old reader! We're going to Tampa too! Amy- you are not alone! I thought so too! My friend introduced me to the Clockwork Quartet, which describes itself as steampunk, but has very little punk involved in its music. Wow, they are really cool! I just spent way too long rummaging around their website, heh. We just saw them at Wild West Con in AZ this weekend--AWESOME! Apparently any number of us went to the faire. Did you happen to see spiderman and the hulk? They may have been the highlight of the day for us. WOW, a new band for me to follow! THANKS! What talent. I also have learned some mime, and the "robot" movements have always fascinated me. The folks vaguely remind me of the animatronic "band" at Chuck E. Cheese and other such pizza joints...VAGUELY. Only not at all creepy or frightening or nightmare-inducing. I could watch these folks all day! I like how The John moves smoothly sideways along the stage as well--I've learned that move myself! Showbiz Pizza! I'm with you on that one! Thought of you when I saw this cute robot necklace. Unbelievable... only I've just watched it so it has to be real. Fantastic talent. Next time we're in Florida (less than a year away, squee!) we will have to track 'em down. And agreed, screaming and smashing does not music make. Yay for melody and rhythm. They should perform at Disney World where robotic performance are a norm. I'd like to see them greet the crowd afterwards as normal people. I believe that the girl is named 'Upgrade', which she was called at the end of the first video. Plus- he's playing a hooter. Am I the only person who remembers what one of those is, and the band that made them "famous" back in the 80s? I'm from Diego and have seen these guys way back when they first got started...that first video from Lestat's West is awesome! One of my favorite music venues for local talent...glad they are getting some big recognition! We saw them this weekend in Tucson they were amazing and so nice! They spent a ton of time talking to my daughter and where willing to answer her endless questions. Oh wow, they are impressive. Their motions are very well perfected, especially in that first video. WOW! Great stuff! I can't imagine keeping up that act for as long as they do. Such endurance!! Oh, and the music is good too :) Thanks for introducing me to these guys! I rarely buy music online, but I ran right on over to iTunes and snatched- er, surfed and downloaded that puppy! I have downloaded 2 of their songs on Itunes so far and have subjected several staff members to watch it...and yes, Rabbit is kind of foxy, it's not just the Nyquil. The Spine's kind of cute too. For those of us that think Rabbit and the Spine are foxy, it is because they are twins. I have been oogling them on YouTube ever since Jenn first posted. I did the disney college program (way too many years ago) and I worked at downtown disney. I was "custodial" which you would think was the worst job but really was actually a lot of fun. When I was working on the west side there was what looked like a mannequin moving in one of the store windows. Then a little girl came to the window and he bent down and waved at her. I was blown away. He was amazing! I love love love SPG. I'm down in San Diego where they are from. They just put together an awesome show out here. So happy to see them on Epbot! I spent last weekend with "the men" at Wild Wild West Con in Tucson and they were awesome!!! OK - I'm a guy reader, and into EPBOT. Thanks for the intro to SPG - LOVE 'EM!!! I love SPG and even though my favorite genre is punk and metal! Thought you might want to know that the first video link is dead. Troublesome internet, morphing on us all the time! I never saw this post the first time around, but it caught my attention while browsing the archives, as I just saw SPG for the first time at Clockwork Con in Austin this January. I had no idea what to expect, but they just blew me away. I love their musical style (it just makes me toe-tappin' happy), and their miming is amazing. Not only do they keep it up for the whole show, they keep it up anytime they're in costume on the show floor. Ran into Rabbit several times over the weekend, and he never broke character once! They have a Kickstarter project going right now (just 2 more days I think) to raise funds to keep them touring. I happily contributed (and bought one album, plus two more songs off the other album)--always happy to support a group that brings me so much joy.